Sistem special conceput pentru toate functiile moderne necesare unui motociclist. Multimedia wireless Bluetooth headset device. 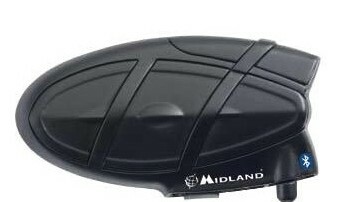 Midland BT Single is the new Bluetooth device designed for satisfying bikers who want to communicate in a simple and reliable way with a unique and practical device. Midland BT Single can be connected in Bluetooth mode to a mobile phone or to a GPS. If used in combination with a mobile phone with MP3 player feature, FORWARD/REPLAY and PLAY/STOP controls can be directly managed from the intercom system. Midland BT Single is fitted with a plug that enables it to be wired to an iPod/MP3 player and to PMR446 trascveivers for bike to bike group communication . The Midland BT Single kit is even more! This device comes with two fixing kits that enable it to be fitted onto the helmet, that is a bi-adhesive strip and a screw -type connector, supplied as standard.This kit includes also an audio stereo system with two speakers and the microphone can be wired or with a flexible arm. The device can be identified from the other Midlan BT Intercom units by its different colour: BT Single is green. BT Single device can not be connected with other Midland BT line devices. Casti pentru urechi de iarna pentru iPhone, statie radio PMR. NEGRU.